This is one serious, serious eye cream. 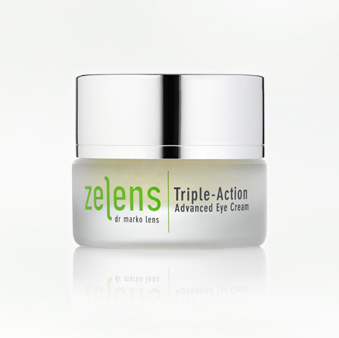 If you’re looking for an all-round troubleshooter to tackle fine lines and dark circles, then the Zelens Triple-Action Advanced Eye Cream should be next on your list. Your luxury purchase list, because this ain’t cheap, but a list all the same. The man behind Zelens, Dr Marko Lens, is a reconstructive plastic surgeon and also an expert in the field of skin cancer and skin ageing. I met him, briefly, a couple of months ago, but it was very brief because a little mishap had occurred. Earlier on that day Dr Lens had spilt acid on his trousers and it had burnt a hole through them, so he had gone home to change them, then for the rest of his day he had been running slightly late. Now. Whereas this little slip of the hand may worry some people (sorry what? My plastic surgeon just burnt a hole in his trousers with ACID? Toodle-pip, then, laters, I’ll give that peel a miss for today!) it had the opposite effect on me. I liked Dr Marko instantly. He was open and honest about his products – very, very frank – and he didn’t do any gushy, pandering-to-the-writer speeches that some people are wont to do in order to gain some favourable press. This chat (all eight or so minutes of it) was just straightforward fact, with me being ever-so-slightly annoying and whiney about ingredients. You can kind of replicate my Dr Marko experience by popping on over to the Zelens website – everything is absolutely clear and straightforward. A full ingredients list and a full breakdown of the thinking behind the ingredients – the science part – are included alongside the product “blurb”, almost a complete blueprint of the product, really. Quite brave, you’d think, but then Dr Lens doesn’t seem to be the kind of man to do things half-heartedly. You can tell that he is absolutely certain that his products work and that he has researched every little detail himself. Anyway, you can see the science behind the products for yourself – it’s really quite an interesting read. My thoughts on this eye cream, though, are that it’s one very heavy-duty player. It’s not heavy in texture, I’d hasten to add, just in performance. Texture-wise, the Triple-Action Advanced is a silky cream-gel that slips over the skin easily (thanks to the silicones) but leaves no greasy residue. It’s absolutely perfect for using beneath makeup, as the silicones provide a perfectly smooth base, and minor fine lines are magicked away. As an instant fix, it’s pure brilliance. But I suppose that it’s the longer-term benefits that we should be looking at in such a high-end product; so apart from the quick-fix, what does it do? There’s a moisturising hyaluronic base to this cream, which helps to plump the delicate eye area. Haloxyl helps to reduce dark circles. Peptides reduce swelling and water-retention in the eye area (bags, then, to you and me) and strengthen the skin by protecting the collagen from glycation (when the fibres between the cells break and skin loses firmness. This fibre-strengthening is also one of the functions of the ingredients in the new Caudalie VinExpert range.) Most exciting, I think, for me, is the “SNAP-8”. Now, I do take skincare claims with a pinch of salt, but I find this one intriguing: Snap-8 is a chain of 8 peptides with an activity that is something like a “natural Botox”. “Natural Botox” is one of my least favourite expressions in the entire beauty kingdom, but at least it gives you some idea of what the ingredients are trying to achieve; in this case, blocking the neurotransmitters that are responsible for muscle contraction (and therefore wrinkle formation) for long-term smoothing effects. As I said, pinch of salt. I do not have the time or inclination to do a clinical trial of my own (though it would be great if I could do one with each and every product that catches my eye!) so I have to put my faith, somewhat, in the man behind the brand. I think that if you have a great reputation (as Dr Lens does) then you’ll want to be turning out the very best skincare that you possibly can. I don’t believe that any skincare is really going to rival cosmetic procedures, invasive or non, but as I don’t particularly want to go under the knife (or needle) any time soon, for me they’re the best option. I rate this eye cream highly, it seems to be working on my dark circles and brightening/tightening the eye area, fine lines in the corners are definitely less visible. This and the StriVectin SD are now my holy grail eye products, being used in rotation! The Zelens is £75, but I only need a dab – far less than I need of the StriVectin, but then the StriVectin is a lot cheaper, price-per-ml-wise. You can read all of the science-y bits here, and you can buy Zelens Triple-Action Advanced Eye Cream at BeautyBay here with free worldwide delivery.